This makes a great last-minute Christmas gift! Fill the mug with homemade hot cocoa mix (or some Swiss Miss packets ;)), mini marshmallows, and a candy cane. Tuck it all inside a gift bag or stocking and you’ve got a thoughtful, fun, and tasty Christmas gift! 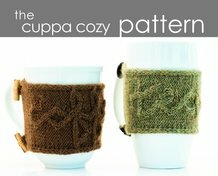 The Cocoa Cozy features seamless construction and includes both charted and written instructions. 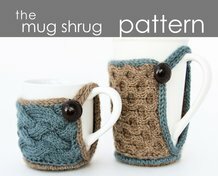 This fun knit goes pretty fast, but it will keep you on your toes.